The whole wheat muffins are in the oven! That scone looks fabulous! I’ll try that recipe next. I love the fork in the road! The cherries are beautiful! I’m sure they tasted just as good in the scones! 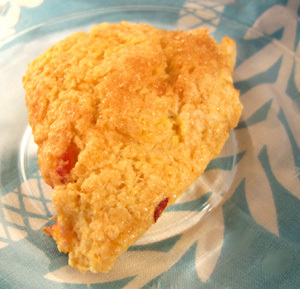 This scone recipe turned out great! I used a little brown sugar on top rather than white, and let the cherries soak in lemon juice a bit too. Thanks for sharing! Just a quick question, though. I had some trouble getting the scones to turn out crumbly and biscuit-like; they ended up having a little bit more of the texture of cake. My dough is really wet and sticky, too, even when I turn it out into flour. Am I missing a step somewhere? These are totally yummy- I added some apricot to my second batch for a bit more flavor. mmmm!